Tales of The Baby Donut: BB'S DONUTS IS HIRING! yep! you read that right! 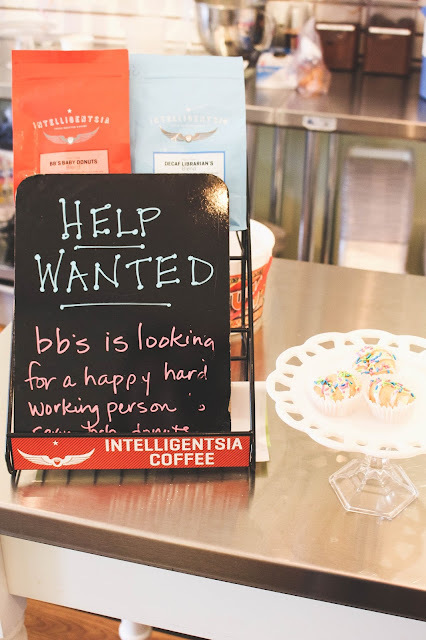 BB's is looking for a little extra help around the store. we want someone who enjoys face-to-face communication, public service, and who has a positive and happy attitude to join our team! there are a few specific positions open, and we want to know your special skills! specifically, we'd like someone during the week, about 2 or 3 days in the morning to open up the shop! we'd also like some weekend help as well. if you're interested, we'd love to have you! stop in the store to pick up an application, contact Debbie Feiler at 708 246 1212, or email her at bbbabydonuts@yahoo.com. we can't wait to meet you!